What is it this time? Did she fall in the cafeteria? Did somebody make fun of her on the bus? Maybe she couldn’t do the PE activity? Or perhaps she had a seizure at school? It was hard for Alison Owens to see her sweet daughter, Kim, feeling upset and isolated again. The young girl deals with an array of medical issues that make her different from other children, and made her life unpredictable. Unfortunately, at school, it has never been easy for other kids to accept a child with slower speech and excessive clumsiness who seems to be visiting the nurse’s office constantly. Alison began making calls and sending emails to Richmond-area organizations that might offer socialization programs for kids with special needs. Because Kim is the youngest of four children, Alison had watched her older children keep active and make friends through sports, but she was at a loss as to how to help Kim. Through research, she found programs available for kids with specific diagnoses, such as autism or Down syndrome. But what about the child who doesn’t have a specific diagnosis? There are thousands of Richmond-area children, teens, and young adults who are disabled, yet have neither a specific diagnosis, nor fall into any commonly used categories. Kim strives daily to live in a world made for able-handed people and those with typical cognitive functioning. She works hard to adapt, living with uncontrollable epilepsy and partial paralysis on her right side as a result of a brain injury at birth. A chance meeting with Kate Tilley of Jacob’s Chance in 2013 changed everything for Alison, and soon after, for Kim (above left). The women struck up a conversation, and the frustration Alison felt over Kim’s struggles were shared. As the executive director of Jacob’s Chance, Kate radiated enthusiasm as she talked about the nonprofit organization. 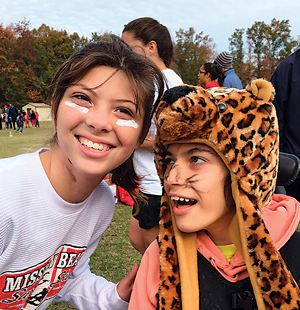 Jacob’s Chance arose out of the Glen Allen Youth Athletic Association, which ran a baseball program called Buddy Ball to help children with special needs enjoy sports. Kate was watching her typically functioning boys play ball one morning when she noticed kids and adults playing on a nearby field. “I saw parents on the field playing beside their children, and no one in the stands to cheer,” says Kate. “I asked if I could help get volunteers to play alongside the children with disabilities so their parents could be in the stands to cheer for them.” Kate says one of her first thoughts was that the parents might enjoy some time to network and socialize with other parents in the stands while watching their kids, a difficulty for most parents of children with special needs. The very next week Kate had a youth volunteer for every child with a disability, and was hooked on the program. In 2010, Kate took over the program, and River City Buddy Ball (a program of Jacob’s Chance) was launched. Kate does not have a child with a disability, but she has involved her whole family in the program. In choosing a name for the nonprofit, officially formed in 2013, Kate decided to honor Jacob Leonard, a young man who had passed away at the age of eleven and a Buddy Ball regular who was known for cheering on his peers. “This is a way for Jacob to live on through these kids, a way to remember Jacob’s smile, and to give kids the chance to experience playing and having an active social life.” Today, kids of all ages with issues that make participating in other recreation leagues difficult play sports year-round through Jacob’s Chance Buddy Ball. Participation is not limited by level of ability or diagnosis. Alison’s daughter Kim plays flag football and tennis in the fall, basketball and bowling in the winter, baseball in the spring, and soccer in the summer. She also benefits from other Jacob’s Chance events, like a memorable surfing experience last summer. “Observers are often surprised by the variety of players they see, as the program focuses on the child, teen, or young adult’s abilities, not any specific diagnosis,” says Alison, who now serves on the board of directors for Jacob’s Chance. Kate adds that “the playing field is a sea of young athletes and their volunteer buddies.” She explains that because families caring for a child with challenges face many barriers, both physical and financial, Jacob’s Chance offers all of its programs at no cost. Last year, to provide even more normalized teen experiences, Jacob’s Chance formed its United High School Board of Directors. This group of young people, with and without disabilities and from a range of area schools, comes together to learn about nonprofit business management, plan monthly events for their middle- and high- school-age peers with disabilities, and learn to work with a diverse group of people. Interested teens are encouraged to contact the organization. In addition, the Family Chance resource program was started this year to provide education and guidance to parents and caregivers. Approximately seventy-five children, teens, and young adults participate in any sports season. 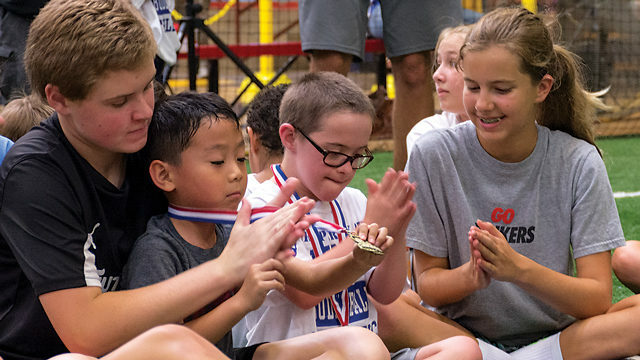 This fall, Jacob’s Chance is seeking businesses and other groups of adults to act as buddies for a Saturday flag football game or for a Sunday tennis session. If your group or business is interested in volunteering, please email Kate Tilley at info@jacobschance.org. If you think your child may benefit from the programs offered by Jacob’s Chance, visit the website at Jacob’s Chance.